Being a ‘Muslim rapper’ is hardly uncommon and carries a whole host of stereotypes. Yet Brother Ali has a refreshing approach in expressing his faith as one part of who he is. Seemingly more open and accepting than ever, Ali booms down the mic “Whether you’re Muslim…or a Lesbian, these just define one aspect of us as human beings.” Similar to others, his trip to Islam’s holy site Mecca inspired an internal reform, visualised by little more than a thin white beard which drops from his chin. First time I shed a tear at a hip hop gig when @BrotherAli was doing an acapella about his father and Eyedea passing. A previously unheard a capella on his progression through life was incredibly raw and touching. The audience were taken aback by the complete openness that Ali displayed in his words, speaking of his grandfather’s suicide and father’s death in a gripping rhyme which silenced all. On promoting the new album, which he claims is his ‘best yet’, Ali emphasised his wish for people to find a way to the content – regardless of how. Watch out for the drop on August 13th. 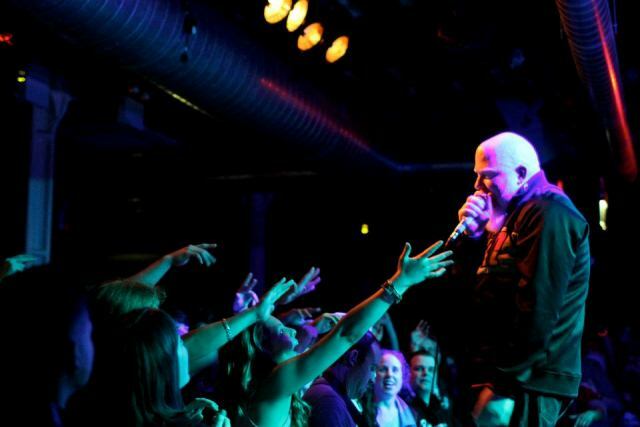 You can download Brother Ali’s latest mixtape “The Bite Marked Heart EP” for free here. Sounds like an inspiring night. Great article!